Rotterdam is one of the world’s largest harbour cities; the Maas is the engine upon which the city runs. However, the ‘harbour’ is now many kilometres away from the city and the river divides Rotterdam into two unequal parts. Now that Rotterdam plans to build two new bridges, the question of how the city relates to the river is again of interest. On Wednesday 1 June at 20:00, the artists John Körmeling and Elian Somers discuss with moderator Christine de Baan the magic of the Maas. The evening takes place as part of the Utopian Dreams group exhibition, curated by Reyn van der Lugt, which features artists’ extraordinary plans and dreams for Rotterdam. The river is a great source of inspiration for artists and architects. In 1977, Claes Oldenburg designed a ‘Screwarch’ bridge to cross the river Maas. In 1981, architect Rem Koolhaas wanted to reconfigure part of the old Willemsbrug into a watchtower overlooking the river. In 1980, the Utopia artists collective designed a large floating platform, including a stage and bar, to provide up to 1100 people with views from the river of the rapidly changing skyline. What is the source of the Maas’s attraction? As Rotterdam’s harbour activity gives way to the bustle of the riverside tourism, how do the rise of architectural icons and the continuing flow of tourists affect the city? The Architect Iris Kievith studied Architecture at TU Delft and often works on redevelopment projects. She relishes the challenge of building on existing things: ‘I believe in the power of a location’s potency and the added value created by respectful and careful engagements with people, nature, material, and space.’ In 2013, she was nominated for the City Initiative for her Urban Hotspring project: a sustainable floating pool and hot spring heated using warmth generated by industrial waste. Prof. H.E. (Riek) Bakker is an urban planner. She is best known for her projects Kop van Zuid in Rotterdam and Leidsche Rijn in Utrecht. From 1986 to 1991, she was Director of Urban Development for the Municipality of Rotterdam. Subsequently, she was director of the Department of Urban Planning and Housing in Rotterdam from 1991 to 1993. In 1994, Riek Bakker co-founded BVR, a consultancy for urban development, landscape, and infrastructure, and was its director until 2007. From 1997 to 2001, she was Professor of Urban Planning at the Eindhoven University of Technology. In June 2010, the Ministry of Economic Affairs appointed Bakker as its Procurement Ambassador. In this role, she highlights the importance of proper procurement to government officials. Christine de Baan is a researcher, curator, and an authority on art and architecture who works at the interface of architecture and design. De Baan was programme director for the Department of Design (DoD) in Cape Town (2014) and of the international design programme Dutch Design Fashion Architecture. She was also head of programming for the International Architecture Biennale Rotterdam, and organiser of the Dutch Design Prize. Hans Werlemann (1948) is a photographer and since 1976 is a member of the Coöperatieve Vereniging Utopia. In the late 1970s, the members of Utopia, then a group of recently graduated architects and designers, based themselves in Kralingen-Crooswijk. They set up workshops, exhibited their work, and organised large parties. Upon the invitation of the Port of Rotterdam Authority, Utopia developed an ambitious proposal called Ponton 010: a giant floating platform with a capacity of 1100 people. 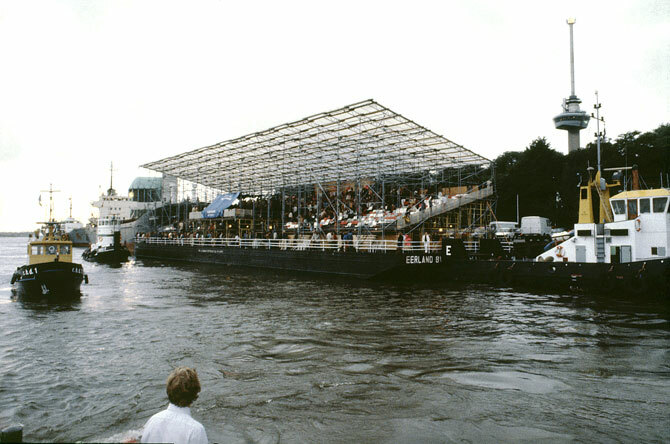 In the summer of 1980, this floating grandstand sailed several times from the port to the city. With the harbour and city skyline as its backdrop, the pontoon’s navigation was accompanied by performances from groundbreaking new-wave bands. Dirk van Peijpe (1962) is an urban planner and the director of DE URBANISTEN. Van Peijpe graduated from the Rotterdam Academy of Architecture in 1997. During and after his studies, he worked as an urban planner at the Department of Urban Development in Rotterdam developing plans for the Laurenskwartier and the Waterfront. Van Peijpe founded DE URBANISTEN in 2009 with Florian Boer. In recent years, the company has developed specific expertise in climate-adaptive urban design and landscape architecture. DE URBANISTEN is a leader in integrating water assignments in urban design, as evidenced by the Waterplein in Rotterdam. Milou Brockhus studied Theatre at the HKU. She is artistic director of the Macabre theatre collective and teaches at Hofplein Rotterdam in the Theatre & Society department. She is a dramaturge, theatre writer, and an artistic coach and advisor. Ruurd Gietema studied at TU Delft where he graduated in 2002 as urban planner. In 2000 he was awarded with the prestigious Maaskant Prize for Young Architects with the collaboration Bindels/Gietema/Hartzema/Klok with works on various urban and spatial design projects. Simultaneously he studied, participated in this collaboration and worked in various Dutch offices including West8, MVRDV and UNStudio from 1988 – 2002. Ruurd became partner in KCAP in 2002. The evening is organised in collaboration with AIR (Architectuur Instituut Rotterdam) and Rotterdam Viert de Stad!